Tourism operators continue to show significant interest in the Eye on the Reef program with this month’s training sessions recording some of the highest participation rates in recent history. Since 2009, trained operators and their crews have submitted thousands of surveys and information on reef health through the monitoring program run by the Great Barrier Reef Marine Park Authority. Marine Park Authority assistant director tourism and education Fiona Merida said survey workshops and in-water training sessions at Cairns, Port Douglas and the Whitsundays attracted almost 100 crew members representing more than 20 different tourism operators. “Training registrations exceeded all expectations and it was amazing to see so many tourism staff committed to helping protect the Reef,” Ms Merida said. “Trainees learned how they can contribute to reef management and help inform state of the reef reports, and performed practical, in-water surveys where they identified health conditions on the reef and recorded their observations." Ms Merida said true success came from crews taking what they’ve learned and completing future surveys as part of their day-to-day duties on the Reef. “Once the tourism operators get back on the water, they will provide valuable, quick and efficient weekly surveys to build an early warning and trend record of health at adopted dive sites," she said. “These weekly surveys are just one of several monitoring and reporting methods delivered through the Eye on the Reef program, which also involves marine scientists and rangers. 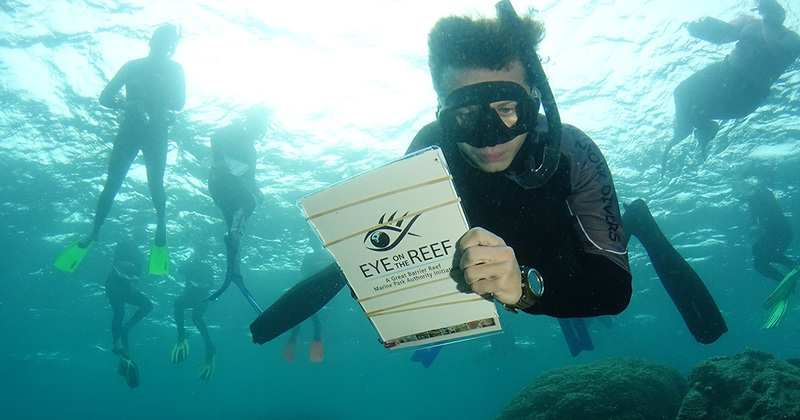 Anyone out on the water can also contribute their knowledge on reef-wide ecosystem health and resilience by getting involved in the Eye on the Reef program. Report your reef sightings and observations by downloading the app. Training sessions were held from Tuesday 8 May to Thursday 10 May at Cairns and Port Douglas, and Wednesday 23 May and Thursday 24 May at Whitsundays. The Tourism Weekly Survey tool provides vital high frequency reef health alerts to inform the Reef Health Incident Response System and trigger management actions. The data from the whole program allows Marine Park managers to compare results on individual reefs and between reefs. Other survey methods within the integrated program are used mainly by the Queensland Parks and Wildlife Service, the Great Barrier Reef Marine Park Authority and researchers.